Field Of Possibilities-- MBL Laddership Circle. What does it mean to lead with Inner Transformation? With this fundamental seed question, we kick started a pilot MBL Laddership Circle to serve the local community in India. Of course, there is no copy-paste answer to this question, as by its very nature, it is dynamic and everyone will have to look for their answer in their own context. So without looking for an answer or any end in mind, we embarked on the journey of unknown and holding collective space for Emergence With a very pure intention and humility of not knowing, we held space for each other’s journeys in visible and invisible ways -- in weekly assignments and reflection on our circle feed, through constant intimate conversation between the fellows and the crew, and on a weekly 90-minute group conversation that triggered a spectrum of insights, stories, inspirations and deeper resonance to the values of 'service' and 'being the change' for others and the world around us. Last week, we wrapped up our first MBL Laddership Circle, and as with all good thing which touches our being, we all felt this is just the beginning. We took off after taxing for a while, gained altitude as we listen to Stories outside and within us, and we were in air Holding Space for each other. Leading with Inner Transformation, we were piercing the clouds of blind spots, which led us to spin in the air with Different Forms of Capital. We cruised on to hit the very pertinent question of Scaling and Rippling, and as we came to the 6th week, we all felt like a Community in air. Where have we all landed? It seems to me that we have landed in a Field of Possibilities. A field which can hold paradoxes, is open to nuances, amalgamating edges and is breeding ground for insights. We ended up sharing a deep resonance to values of Inner Transformation and collective conviction in Compassionate design-building on gift ecology. A very resilient field of such kindred souls ended up serving each others’ journeys in unseen ways, and everyone felt profoundly grateful to visible and invisible forces behind this circle. It is difficult, to sum up, everything that transpired in last six weeks but would like to pen down five insights which touched all of the fellows and crew, and was quite apparent. 1) What does being the change mean? Why does it matter? Why 'inner' transformation only, what about the 'outer'? And how does one affect the other? Should I be my change or help you be yours? Vinit experimented with being the change in his office setup. He calls this initiative: “TWS: Transforming Work Spaces”! He gathers courage and proposed his MD to start every meeting with a minute of silence and started tagging the team with small gift and gratitude note. He feels he find considerable change the way people organize with each other at work and the whole process was very transformative for him. Shalini went ahead and expressed her gratitude to her colleagues at school in Auroville, by anonymously tagging them with notes written on decorative postcards that she made. The writing took time, but instead of rushing it to get the job done, she found the patience to wait till something authentic came up. This act changed everyone's internal narratives and multiplied into greater and deeper shifts within everyone. Pranita wondering about her approach to volunteer coming together for Volunesia, she thought of changing the question from "How can they help us?" to "How can we help them?" Mihir wondered whether they are two different things and if one sees them as different, can one really be the change? Ragu observed that there needs to be a connection before the question of change arises. 2) What it means to hold space? Can we hold space with effort or it is effortless? Raghu remarked, 'Holding space' is not something we do - it's more like being aware of the now and be held by space. Having a sense of being in a larger space - being in the 'zone.' When one is tuned in completely into the present moment, holding space is not about being quiet, it is about occupying the “now” more deeply than we normally do. Mihir, told a story of Rev. Heng Sure who wrote to his teacher, “Why do I feel tired and burdened down? It is because discriminating between right and wrong takes a lot of energy. And finally, it's all in vain.” Mihir posed the question: can one hold space or is it held organically? What role does effort play in holding space? Smita-ben has created a space for listening at her office for people fighting difficult situation in life, and a space of sharing and listening has created a great sense of connection. She understands deeply through each circle what holding space means and the magic it creates when space is held with deep listening. Trupti shared earlier when someone approached her asking they wanted to talk or consult her; there was a compulsion to come up with some answers or advice. While pondering upon holding space, she realised that it's okay not to have all the answers and within that - "I don't know,” Answer if need be will emerge. Audrey shared that when we hold space, we are shifting the default environment within ourself and around us. We are shifting our default environment in a way to ignite the values that we hold deeply within our heart. 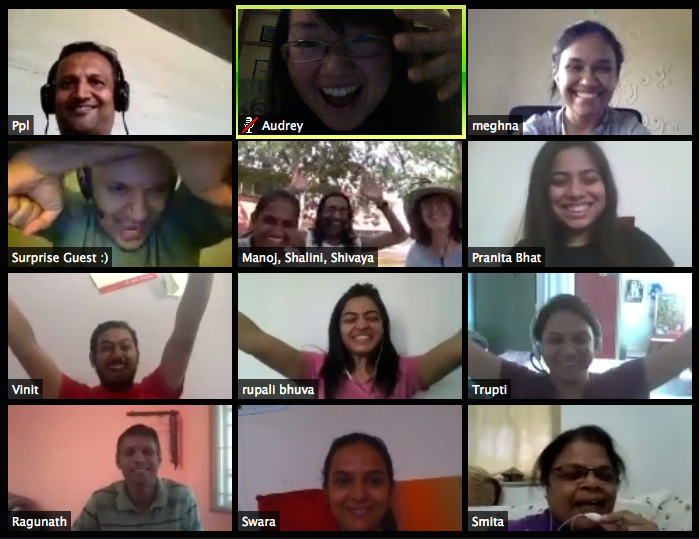 Parag shared a beautiful story, which is profound to him about Surat retreat in 2015, wherein Audrey listened and held space dynamically even though she did not understand the language! She was emceeing, and the circle started in Gujarati, a language that she didn't understand. The depth of her attention through the two days was felt by each one in the gathering. Today after a couple of years, no one remembers the content of the presentations done in the retreat but retains the presence that she brought to the circle. 3) What do we understand by different forms of capital? What are the edges to financial capital? Shivaya felt that her Auroville community is swimming in different forms of capital all the while, though she never saw it in that manner. Ragu shared insight into nature and how different forms of capital are in constant play in nature, sharing an example of the banana tree and the coconut trees how every part of tree other than the fruit is a form a capital and can be useful for us. Swara commented that listening is one of the windows in converting one form of capital to another. Parag shared how our definition of giving is limited to material resources. We tend to limit giving to those who are materially poor. How can we create conditions where giving is happening every moment? Thinking about different forms of capital, he felt that being present to the moment ripens the conditions of giving, and that can happen through different forms of capital. Is it effortful or is it effortless? That is the question he is holding. Vinit shared that he agreed with the fact that money has its place as a tool, and the edge that he is holding is that Money can sometimes tap into ignorance whereas wealth taps into awareness. So how do we use money as a tool to reduce this ignorance? Mihir shared that money has its place -- you need a certain amount to Be -- but when you try to Become something else, the urge for more comes in. Jaimit shared about an interaction with Arundada, which lead him to value his job from the perspective of wholeness rather than from the narrow lens of remuneration. 4) What is the power of small acts? How can we achieve scale with small acts? When we think of scaling, we tend to look at it in the dimension of space, and not time, shared Manoj. We tend to think of scale in terms of a global reach - which is spatial, as against thinking in terms of a change which last for hundreds and thousands of years, which is in the dimension of time. Ragu brought out the instance of how a group of people sitting together to meditate was said to have brought down the crime rate in the Washington, D.C. area. How this scales in the dimensions of time and space is unclear, but it does. 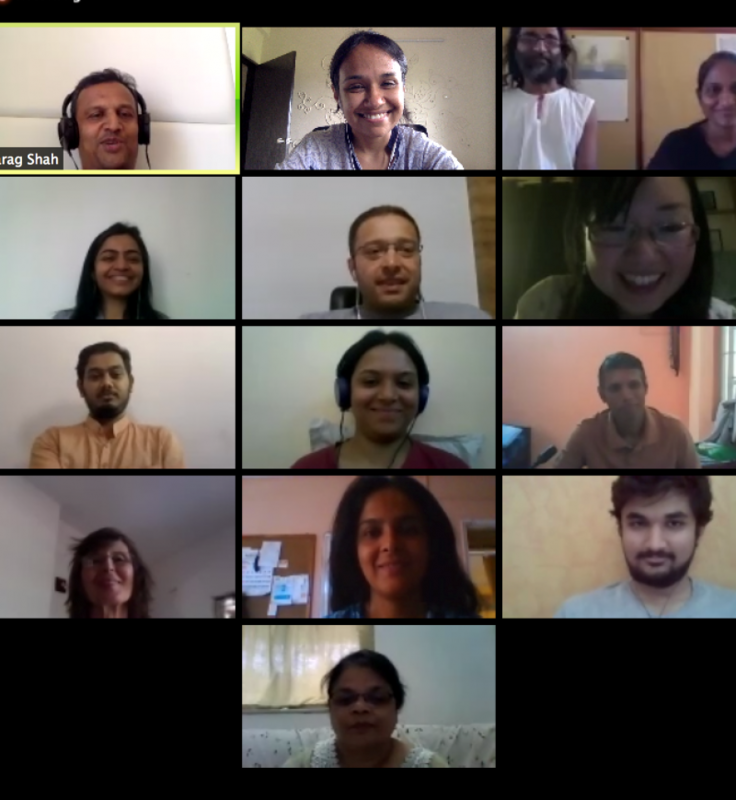 Vinit recalled how a couple of years ago, when the video of Karma Meals came out, one of his colleagues at work shared it within the group, which led to a discussion about whether Karma Meals should accept money from the company to scale up. Seeing the need to step up internally instead of scaling up, Vinit encouraged each of his colleagues to reach out to a few others, and in that way, Karma Meals would scale up organically. Jaimit recalled how India's former President Dr. APJ Abdul Kalam once told a colleague that whatever one does with heartfelt presence, would eventually ripple out in the world in it's own way. Trupti also resonated with the need for depth of connections and put it interestingly as scaling horizontally and vertically. She sees horizontal scaling being about numbers, while vertical scaling is all about deep ties. As she holds this question of whether to publicize the activities they do in their local community or let them grown organically, she feels called towards the latter. Swara shared her takeaway from the conversation, that scale is multi-dimensional. 5) Are our belief and behavior our own or are they influence by the collective? What is the relationship between the part and the whole and how they influence each other? The theme reminded me of a very famous quote of J Krishnamurti-- To be is to be related. Our life exists in relationship to people. Mihir gave a broad context to the theme citing a beautiful story of heaven and hell, and the only dividing lines between them are how do we organize with people around us. Jaimit shared how reading the thank you mail after every call inspired him to write gratitude note to all awakin circle participants in their local community. Ragu shared it’s not the design but under what circumstances people come together? What is the field in which people come together? Audrey wonders, how do you create structures and conditions for deep listening and awareness? and shared about a shoe company that brought down a bridge and structured the walkways in such a way that people would deliberately bump into each other which would enhance more social connect and also shared about the Ritz Carlton hotel’s 10/5 Way design principles that led to better social connections. Shalini feels, community connections, however, are not one of the interactions but they build-up when each time a smile is exchanged, a simple hi or a heart-to-heart chat. As I reflect back, I can sense how Shivaya's enthusiasm to learn, Manoj openness to new ways of learning, Vinit's experiments of laddership, Shalini's commitment for every action, Jaimit effort in community building, Smita-ben bringing presence through listening, Pranita's bold experiments to be the change, Trupti's strength in the narrative 'world is good', Raghu's wisdom in motion, Rupali heart in the circle, created the field of collective wisdom which in turned enrich everyone of us. I am left looking at so many answers in this collective field of possibilities.